GoTrunk is a complete fully featured SIP Trunking systems. It allows you to connect in house IP PBX (SIP Endpoint) to make and receive phone calls from the Internet and traditional telephone networks (PSTN) at the same time. It makes managing your communication easier and helps to reduce operating costs and increase productivity. The web control panel is optimized for a screen resolution of minimum 1024 x 786 pixels. Figure 1.1 How SIP Trunks Work. (1) Manage PBX safely behind Firewall. (2) GoTrunk manages all connections for making and receiving Calls from traditional PSTN and Mobile (Cell) Networks. (3) call any land line or mobile (cell) phone at very low rates. (4) make and receive free Internet calls to other VoIP networks. (5) make and receive free Internet calls to other GoTrunk SIP Trunk Clients. This is a web based application which allows to manage all aspects of your SIP Trunking account. Create new SIP Endpoints, assign Caller IDs and provision inbound numbers. This is an SIP Enabled IP PBX typically installed at your premises where user's phones (extensions) connect to. 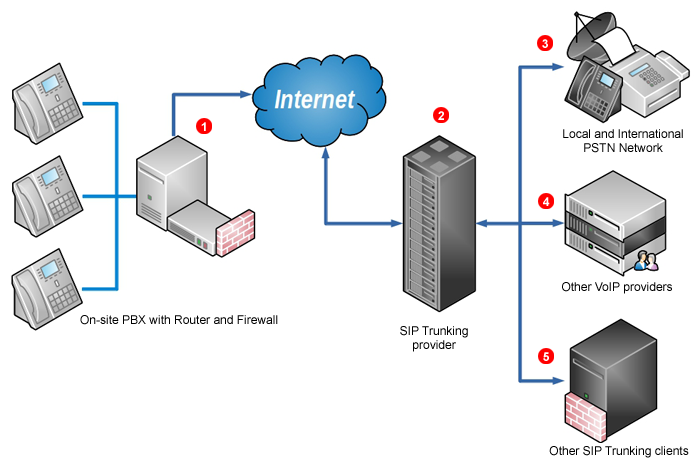 SIP Trunk is a connection between IP PBX (SIP Endpoint) and GoTrunk network which connects calls to and from PSTN (Plain Switched Telephone Network). Inbound number also called Direct Inward Dialling (DID) in USA, Direct Dial-In (DDI) in Europe, is a range of telephone numbers connected to your PBX, so it can route the call to the desired person or Ring Group (IVR etc.) within the organization.